As world leaders wrapped up their meetings at the G20 Summit in St. Petersburg, Russia, Foreign Affairs Minister John Baird said Canada supports calls for a military intervention against the Assad regime in Syria as a direct response to that government&apos;s use of chemical weapons against civilians. "What are people going to say next week if 5,000 people are gassed? What are people going to say next month if 25,000 people are gassed?" he said in an exclusive interview with host Evan Solomon on CBC Radio&apos;s The House, following a meeting with Sergei Lavrov, Baird&apos;s Russian counterpart. "This is a poor man&apos;s weapons of mass destruction and this guy cannot be allowed to get away with it." The civil war in Syria dominated much of the St. Petersburg summit, where U.S. President Barack Obama sought support from world leaders for a military intervention, while Russian President Vladimir Putin affirmed his support for the regime of Syrian President Bashar al-Assad. "We have a fundamental difference of opinion," said Baird. "Russia has been an ally of Assad. They&apos;ve helped arm Assad. Their support has allowed him to soldier on for more than two years now." Baird also said he is not optimistic that Russia will change its position on any upcoming Security Council vote on Syria, where Russia and China have blocked resolutions calling for intervention. On Tuesday, Obama will address the American people as he seeks congressional approval for military strikes against Syria, which the United States has said it would lead. Opinion polls show public support for such an intervention is low. 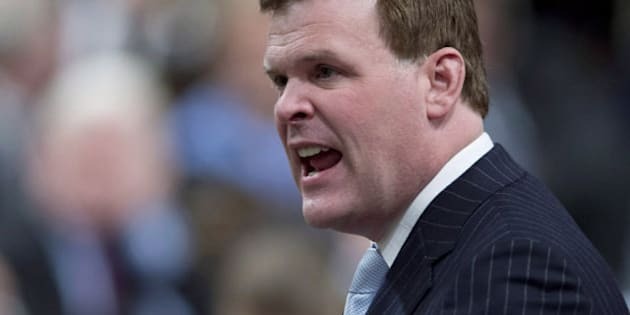 Baird said Canada has not been asked to contribute militarily to that effort, but that the United States has Canada&apos;s full diplomatic and political support. Baird also announced $45 million in new humanitarian relief funding in response to an urgent appeal from the United Nations. More than two million Syrians have fled to surrounding countries to escape the violence, which has killed more than 100,000 Syrians since the begining of the conflict. Prime Minister Stephen Harper also expressed grave concerns over the use of chemical weapons, which American, Turkish and French intelligence say was used by Assad&apos;s forces in an attack outside a Damascus suburb that killed more than 1,400 people on August 21, 2013. "I believe that what we&apos;ve been seing over the past several months is the Syrian government, which finds itself in a stalemate, believes that it can win the war, the civil war in Syria, through the use of chemical weapons," Harper said in a news confernece on Friday from St. Petersburg. "And they have been step by step ratcheting up that usage to see if anyone is going to challenge it. And I fear that if no one does challenge it they will use chemical weapons way beyond a scale that we have seen today to win that war. And if that ever happens, as I told the leaders last night, that is a precedent that humanity will regret for generations to come," he said. Former U.S. Ambassador Richard Williamson says there is a moral obligation to respond to the use of chemical weapons by Assad. "Monsters like Adolf Hitler and Saddam Hussien used chemical weapons," Williamson said in an interview with Solomon on The House. Williamson served as ambassador to Somalia under former U.S. president George W. Bush. "We don&apos;t want it to become something that is used more frequently. Assad&apos;s use of chemical weapons is a particularly urgent challenge not only to deter him from continuing to use chemical weapons but also as a signal for the others, because we have some 80 or 90 countries with chemical weapons in stockpile and don&apos;t want them unleashed against innocent people or anyone for that matter." Williamson thinks Obama has a tough sell as far as convincing the American people that the United States should launch military strikes inside Syria, strikes that Williamson thinks needs to be sustained and targeted at major military and communications infrastructure. "In Kosovo there were no boots on the ground but NATO engaged in 78 days of brutal aerial assault and bombing and brought that ethnic cleansing to an end. I think it has to be targeted to eliminate some of their military assests — their six airfields that primarily are the ones used by the Syrian military — those should be and can be destroyed," Williamson said. "We also have the capacity to destroy their communications centres. These would be steps that would not seek to have massive human casualties but would substantially change facts on the ground and hopefully lead Damascus to go to the bargaining table to seek a political settlement," he said. Listen to the full interviews with Minister Baird and Richard Williamson on CBC Radio&apos;sThe House.